In this issue's cover story, experts tell us that money has become a taboo topic and that technology has fostered our disconnection from money. We have credit and debit cards, and we use our phones to move money around; we are disengaged from it. Lack of understanding about money has created a serious threat of financial illiteracy among many who do not understand how critical it is to know how their finances affect them and their families or organizations. Fortunately, financial social work is coming to the forefront of practitioners' and educators' focus. An individual's, a family's, and even an organization's finances affect all other aspects of the unit. For social workers to achieve efficacy in this area, financial social work must begin in the social work classroom. 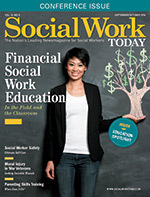 Our cover story explains how several organizations, including NASW, CSWE, the Center for Financial Social Work, and the University of Maryland School of Social Work's Financial Social Work Initiative, are taking steps to ensure that financial social work is integrated into all areas of social work practice, across the curriculum. It is with much sadness that we acknowledge the passing of one of Social Work Today's long-time editorial advisors, Mila Ruiz Tecala, MSW, ACSW, LICSW, DCSW. Mila had been a Social Work Today editorial advisor since its inception. Her practice, the Center for Loss and Grief, focused on helping people rebuild their lives after experiencing the death of a loved one. She coauthored Grief and Loss: Identifying and Proving Damages in Wrongful Death Cases, a book written to help attorneys and mental health professionals better understand their clients' needs, and was NASW's Social Worker of the Year in 2000. Mila provided Social Work Today with expert guidance on many issues, especially on the topic of grief and loss, and we will miss her so much. Thank you, Mila.